Like salaried professionals, those who work from home must also pay tax. They are also entitled to various tax deductions. Many people who work from home, either full-time, part-time or as freelancers, often believe that since they work from home, they are not liable to pay taxes. The fact, however is that whether you are a freelancer, or have a small business set up at your home, and your total annual income exceeds Rs. 2.5 lakhs, filing taxes is a must. But in addition to this income being taxable, it is also liable for tax deductions. If you earn more than Rs. 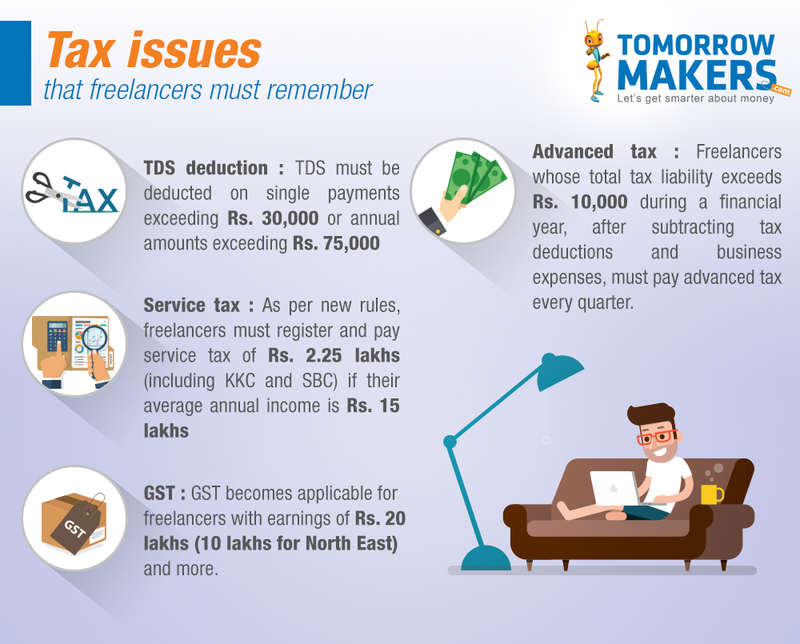 2.5 lakhs a year and work from home, here are some ways to reduce your taxable income. Business related expenses: Rent from your home-office, repair or renovation work, office supplies such as stationary and computer, travelling bills, etc. are examples of business expenses you can claim as deductions. However, these expenses must be related strictly to office work, and should not include any personal expenditure. If it includes personal expenses like laptop or mobile phone, only part of it can be claimed as deduction. Similarly, if you live in a rented apartment and use one room as an office space, the deduction will be limited to only that room. Hence, only part of your rent is treated as tax deduction. Depreciation of assets: Any equipment used for your work is considered your assets. Depreciation of furniture, technical equipment such as computers, laptops, cameras, etc. fall into this category. Since their value will depreciate with time, they can be claimed as tax benefits. This also includes depreciation in property value. However, rates and the method of depreciation varies from state to state. Monthly bills: All business expenditure related to monthly bills like landline and mobile bills, electricity bills, internet bills, petrol bills and in some cases medical insurance too can be claimed under tax deduction. Consultation, course or training: All the expenses made in professional learning, including training, attending conferences, workshops, and courses that sharpen your professional skills are also included in tax deduction, which you can claim at the time of filing income tax returns. If you are seeking a professional’s assistance, the fees paid to him or her can also be claimed as deduction. Related: How is taxable income calculated? Failed invoices: If your client hasn’t paid you for services you have rendered, you may claim those bills that are not paid as deduction too. However, you will have to submit proof of work done for the client and proof of the invoice raised for the activity. Transaction Fees or Domain fees: Freelancers who work with overseas clients, may avail some third-party services for their transactions. These transaction fees can be claimed under tax benefits. Apart from this, if you’re paying any fees to maintain a domain or a website online, that can be used for deductions as well. What makes tax-saving exercise an important financial planning tool? Just bought a new car? Here’s what you need to do next! If you’ve just bought a new car or are thinking of getting one, there are some important formalities you must complete.